Many major airlines fly to both Los Cabos International Airport (the “Twin” cities of San Jose del Cabo and Cabo San Lucas) and the International Airport at La Paz, the capital of Baja California Sur. Both destinations are considered very safe for foreign travelers. A passport is required to enter Mexico. Parents traveling with minor children but not a spouse must have a notarized document from the non-traveling parent giving permission to bring the child to Mexico. PASSPORTS ARE REQUIRED FOR INTERNATIONAL TRAVEL. Major car rental agencies such as Hertz and Avis service both airports. The drive north from the airport in San Jose del Cabo to the resorts is about 45 miles on paved highways, although at some points the roads weave through beautiful but rugged mountain terrain requiring slow driving. It takes 45-60 minutes to reach the resort town of Los Barriles, where you’ll find Hotel Palmas de Cortez, the Villas de Cortez Condominiums, and Hotel Playa del Sol–all located right on the beach and easy to find. To reach the more remote Hotel Punta Colorada, you have to detour down a 15-mile stretch of dirt road, which takes about 30 minutes. Many visitors explore vast stretches of the Baja by rental car, and again, this region of Mexico is considered very safe for foreign travelers. Taxi services are readily available upon your arrival at the airport, although you may find yourself haggling about rates. Most East Cape Resorts guests prefer to pre-book their ground transfers through our exclusive shuttle van service, East Cape Transfers (T.T. Cabo del Este). Our professional, uniformed drivers will meet your party in the shuttle parking area located OUTSIDE of the terminal, holding a sign with the lead guest’s name. See the “Rates” page for more information. During your stay at East Cape Resorts, if you’d like to tour the resort city of Cabo San Lucas (90 minutes south) or the capital city of La Paz (2 hours north) for shopping excursions, sightseeing, world-class golf outings, and more, you can make arrangements on the spot to hire one of our vans to take you on your tour. The driver will stay with you during your entire trip. All hotel rooms are air-conditioned. Each has a minimum of two beds; most have three or four beds. All rooms come equipped with small refrigerators. Some rooms as well as the condos are equipped with satellite TV. All rooms are tastefully appointed and feature daily maid service. All rooms have tiled baths and changing areas and full vanities; the water at our hotels is completely safe to drink right from the tap, as we draw and test our water from our own well supplies. Bottled water is available in ample supply if you prefer. Meals are served restaurant-style in the dining rooms at each resort, or on the outside verandas for special occasions. A variety of American and International flavors are available, as well as Mexican and seafood buffets. Fresh fish is typically served as a side dish. Chefs at each resort also can prepare your day’s catch as hors d’oeuvres or as a meal if you so choose. Afternoon snacks are often served poolside while you relax after a day’s fishing. Each hotel room features a phone and U.S. dialing instructions. Long distance charges will be billed upon checkout. Some cellular phone services work in our region, depending on your cellular carrier and any international dialing plans your carrier may offer. Free wireless internet service is offered at each of our three hotels, and there is an internet cafe located in the town of Los Barriles as well. For emergency contact while in Mexico, contact us directly and we will reach your party. The boat fleet at the hotels is the largest fleet on Baja’s East Cape. They are moored directly off the beach and accessed by our roll-in ocean docks or via Panga (skiff). Boats come equipped with all tackle, rods, reels, and terminal gear that is rigged and prepared by your captain/mate. Our gear is heavy (25-80# test) for big fish. Fishing gear can be rented by the day for a nominal charge, or bring your own gear to use at no extra charge. Light tackle enthusiasts should bring their own gear. Some anglers bring light tackle or fly fishing gear, either to use on the boat or to fish from shore. Excellent shore fishing is available here, especially at Punta Colorada. Our fleet features a variety of boats, from 28-32-foot cruisers and super cruisers that run single or twin diesels, or 23-25-foot center-console super pangas rigged with high-horsepower outboards, some dual engine. The cruisers offer heads, while the pangas do not. Cruisers are skippered by a captain and mate who share duties; a solo captain skippers pangas. Our crews are very knowledgeable about local conditions and speak English. They are eager to teach novice saltwater anglers how to fish the Sea of Cortez. Captains know where the fish are biting, but are happy to go after whatever species you want to target. Many times the areas holding species like marlin and dorado differ from the areas holding tuna. Decide what you want to fish for and tell your captain, or work with him during your stay to explore all the variety in the Sea of Cortez! Options include fishing for inshore species such as roosterfish, jacks, and mackerel, or offshore species like marlin, sailfish, tuna, dorado, and wahoo. Angling tactics primarily feature trolled lures and the presentation of live and dead baits to fish seen on the surface, and occasionally drifting. Bait skiffs meet your charter as you leave the dock each morning. Depending on the season, a variety of caballitos, mackerel, sardines, or pilchards are available, sometimes from different bait boats. Be prepared to have $10-$30 USD ready each morning to buy your bait. Your captain/mate will choose lures, presentations, and tactics that are working at the time of your arrival to help you catch the most fish. Gratuities are appreciated in exchange for excellent service. Standard tips for your crew are 10-20% of your boat’s charter rate. Tipping of bar and restaurant staff and your housekeeper follows U.S. guidelines. All other activities can be arranged directly with your front desk representative. Choose ATV, dune buggy, sea kayak, and Jet Ski rentals, or go horseback riding. Palmas de Cortez and Villas de Cortez feature a 9-hole “chip-n-putt” golf course on the grounds. Golf equipment rental is available. Eco-tours of the surrounding Sierra de la Laguna mountain range (to hike and explore while visiting native rock painting sites, spring-fed pools, and waterfalls) are available. For a thrilling experience, go on a guided Zip-Lining Canyon Tour with professional guides. Using our Dive Boat “Manta Ray,” certified divemasters can coordinate dives on the Living Reef at Cabo Pulmo-equipment rental, boat ride, and supervision is included. Bring your snorkeling gear to explore the beaches and inshore reefs. Bring your cameras with plenty of film/disks, sunscreen, lip balm, and polarized sunglasses, sun hat, light tackle if desired. Comfortable, light clothing for most of the season, light windbreakers and wind pants for cool mornings in December and January. Swim suits and a T-shirt for fishing, shorts and dress/casual shirts for dining. Sandals and/or tennis shoes. Gift shops at each resort have supplies of toiletry items, basic items and necessities, and a variety of gift items. The town of Los Barriles has a well-stocked supermarket and numerous other shops and stores with bargains on everything under the sun. There are several local restaurants and taco/fresh seafood kiosks available to choose from. US dollars and pesos are both accepted as currency, and many of the restaurants and shops accept credit cards. The entire town of Los Barriles is accessible on foot from the grounds of Hotel Palmas de Cortez, Villas de Cortez, or Hotel Playa del Sol. Hotel Punta Colorada, being remotely located on a sandy peninsula, features no outside amenities unless you grab a shuttle van to town. 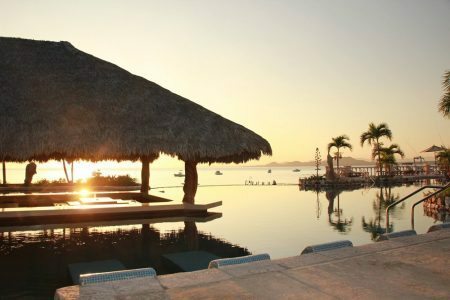 On the other hand, the peace and serenity at Punta Colorada is second-to-none.